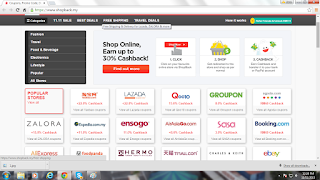 If you're a frequent online buying vouchers from Fave and Ensogo, get goodies from TaoBao, fashion stores like Zalora and Lazada, ordering food at Food Panda, book travel tickets online at Air Asia Go.com, Agoda and Booking.com and many more, then shop online with Shopback will be your choice to get Cashback. 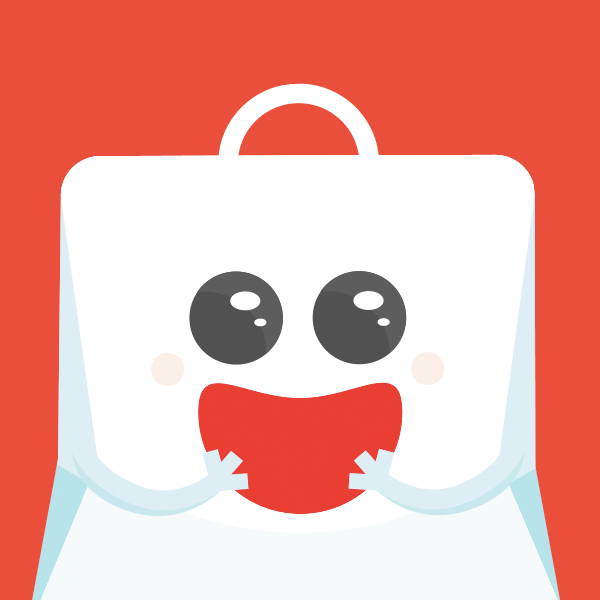 Shopback is a cashback site that pays you to shop with their more than 500 online merchants. Just click through and shop with their merchants through their site. For the travellers, don't miss out on these Expedia coupons listed on their site. 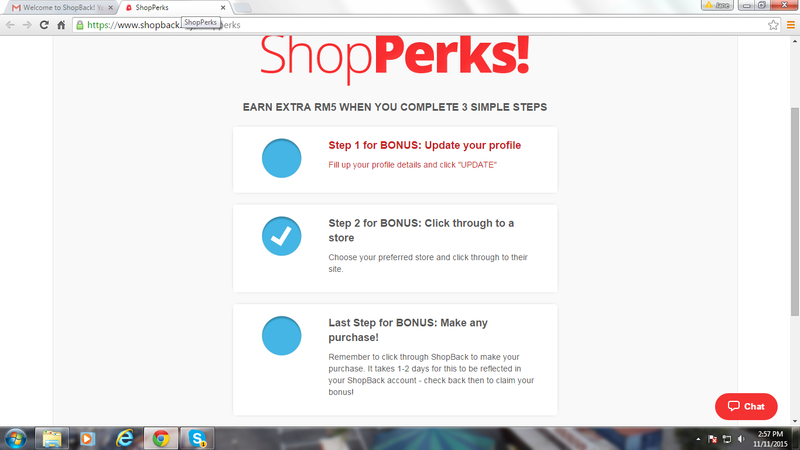 Now, let me guide you on how to shop at Shopback. Step III : Make any Purchase ! Step 2 : After look through all the merchant stores, I choose Fave and it'll direct me to see how much percentage of cashback that I'll get back once I made a purchase at Fave. Wow... 8% Cashback on top of the promotions and voucher codes. 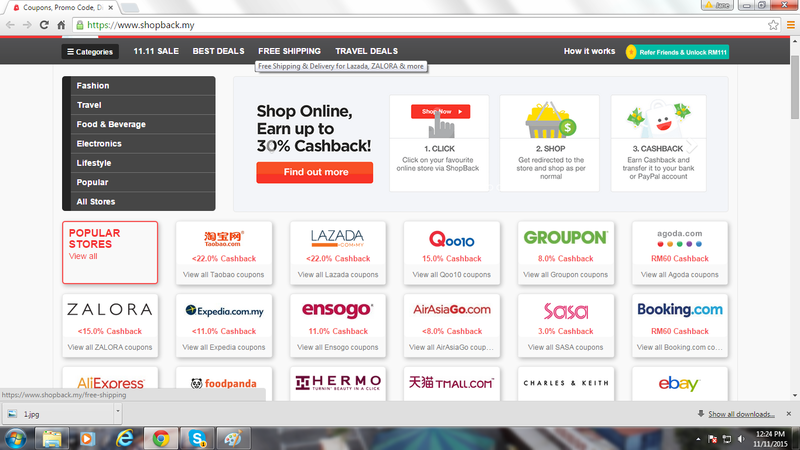 Step 3 : After knowing my cashback that I'll get at Fave, I click at the button "Shop Now" and it'll direct me to Fave website where I can shop for my vouchers as usual. 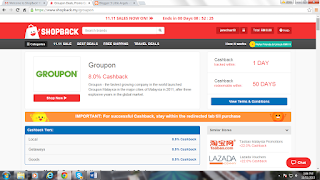 Cashback will be added to my Shopback account within a day. Step 4 : Choose the vouchers that I had wanted. 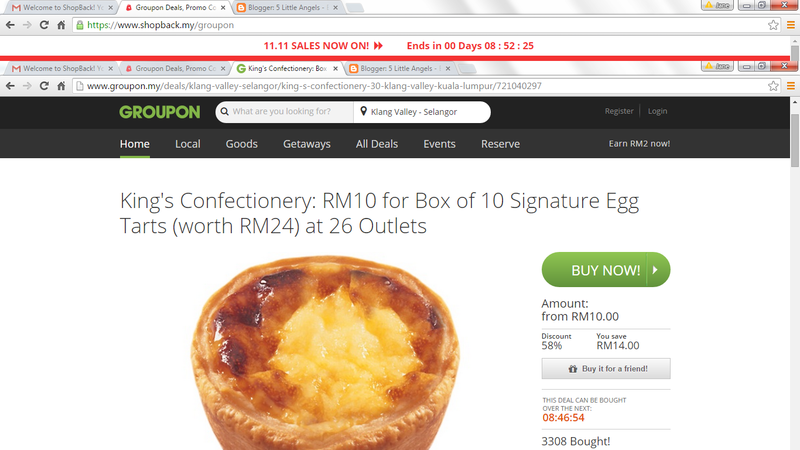 RM10 for a box of 10 Signature Egg Tarts (worth RM24) at 26 King's Confectionary Outlet was really tempting. Click buy now and purchase the deal. After making payment, the cashback of RM10 X 8% = RM0.80 is credited to my Shopback account, which can later be cashed out into my bank account or PayPal for real cash. Now only RM10. Imagine that if you purchase RM1,000 a month, then you can get RM80 cashback which is quite a lot for me since I am a frequent online shoppers. 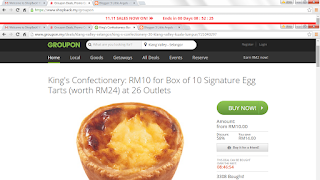 Shopback is a legitimate service and they had established themselves on only in Malaysia, Singapore. Philipines, Indonesia and planning to expand to the rest of South East Asia. Just for today, Double, 11.11 sales was finally here. Just for 24 hours, the biggest and the hottest discounts, voucher codes and cashback where you can get up to 95% Discount, Crazy Cashback of up to 22% and Amazing Voucher Codes awaits all of you. With so much of benefit, sign up now at Shopback and earn your cashback on top of all the existing credit cards, discounts, promotions and rebate. Enjoy RM5 bonus credit referral fee from Shopback when you give your friend RM6 to make a purchase, Invite 11 friends to unlock the bonus of RM111. So, click at my link HERE to register for Shopback. Happy Shopping, Everyone. 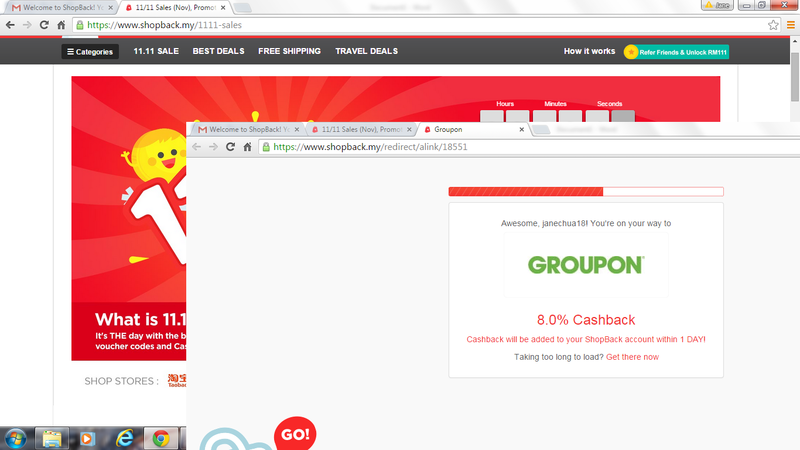 Shop More, Save More and Earn More with Shopback !!! how to save money la with all the offers like this? really shop till i drop! haha. Geng Qian, buy more to earn more lor. With the huge discount today, don't miss it out ya. 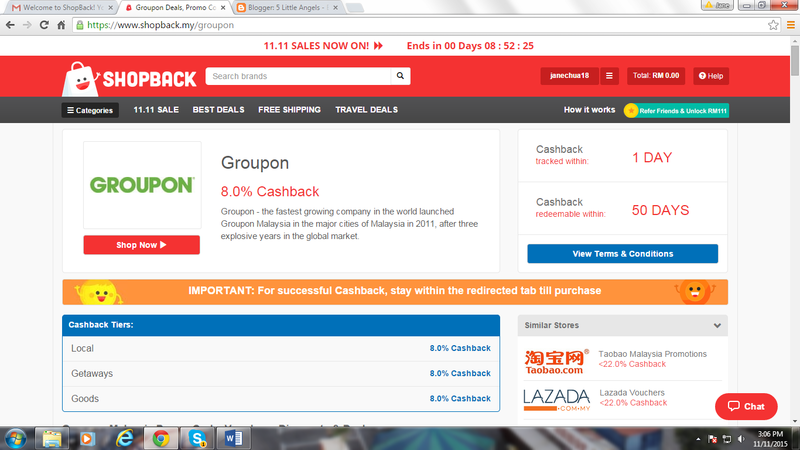 Kakalina, remember to shop today to get extra discount and cashback ya. All the offers going around today , my bank is crying !! Michelle, 1 day sale not to be miss. Anfield, very easy to use. Just follow my steps above. Once done, you can save a lot. Online shopping... somehow, it still doesn't catch on with me, I still prefer the physical see,feel,touch sensation when i'm buying stuff. Michael, its a trend now to shop online as you can save more and now you can earn it too. Selina, great to hear that. 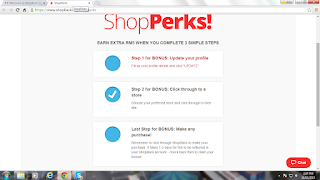 Lets shop together at Shopback to earn more ya. I think its time to figure out how to use this! Trislynn, just click at my link there and start the registration and purchase your items. As easy as ABC. Wanderess, shop and earned. You'll have plenty to shop with. I used this too. Saved me alot of money. Ellie, great. Lets save together. Linda, betul. Can get cash back somemore on top of the discount.